ETS designs, builds, operates, and optimizes decentralized power generation systems for commerce, industry, and municipalities – cost-effective, environment-friendly, future-proof, and with perfect service. From the efficient hot-water and steam supply system to decentralized power generation systems with connection to innovative storage technology – ready-to-connect systems with a high overall efficiency for your safe energy supply. ETS designs, builds, operates, and optimizes power generation systems for commerce, industry, and municipalities – cost-effective, environmentally friendly, sustainable, and with perfect service. In addition, as constructors we are independent of manufacturers. As a matter of course, we consider the best currently available technology, as well as legal requirements – and support options, on which will be happy to give advice. Furthermore, we are certified as pipework construction specialist company according to AD2000 HP0 /HP 100R and ISO 3834-2. 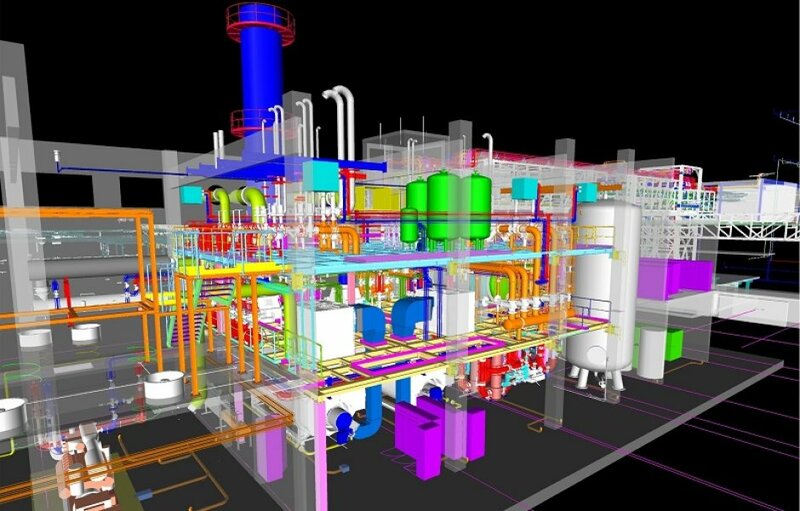 Construction plan of a high-performance ETS power station with two efficient high-pressure steam generators, refrigeration system and innovative combined heat and power plant.